and braved the elements. 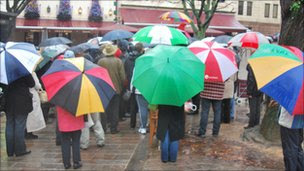 Weather-wise, it was truly a miserable day, but it was warming to see some familiar and some new faces in the 100 or so strong crowd to protest about the Treasury Minister's proposed increase in GST which is a slap in the face to ordinary residents, families, pensioners already struggling with Jersey's high cost of living. Thanks to all those who spoke. We were particularly please to have two special guests: one Mark Thomas, comedian and political activist; and local young musician/songwriter Jordan Delap, who performed an impromtu (acapella) version of sing song '(NO MORE) GST APATHY'. The song was composed especially for the event and the words can be seen below. Along with GST, Osouf and co.! It was a pleasing turn out indeed given the appalling weather and only 3 weeks to Christmas. I think you should take heart that people did make the effort. Mark Thomas was refreshingly amusing, but sadly I had to leave before the music! Good luck and onwards and upwards. Just a little to controversial maybe? Didn't have time to upload it to the BBC site on Saturday.